While some transcription companies may feel threatened by the push for electronic medical records, those that embrace the technology could come out ahead. Have you had a client tell you recently that, while they’ve loved working with you over the past several years, they’ll have to discontinue your transcription service because of the “EMR mandate”? How did you respond? When this happened several times to our company, we decided to learn about this mandate so we could survive and thrive in a changing industry. This is not a mandate but an ambitious goal to have EHRs by 2014. What does this mean for those of us in the transcription industry? Should the transcription community be advancing the adoption of EMRs when many vendors promote them as a way to eliminate transcription costs? I believe so but, as an industry, we should be advocating for dictation and transcription as part of the EMR workflow. That may seem a little self-serving coming from someone in the business—until you know our company’s history. We began as a software company selling front-end speech recognition and electronic chart notes as a replacement for transcription. What we discovered was that the vast majority of doctors (80% or more) preferred to dictate their notes and had good reasons for doing so. We found that while technology can replace traditional transcription services, it’s often not a good use of physician resources. As a result, in 2006, we became a transcription company offering both services and software. With that bit of perspective, there are several keys to turning the so-called EMR mandate into a business opportunity for medical transcription. Notorious bank robber Willie Sutton was once asked why he robbed banks, to which he allegedly replied, “Because that’s where the money is.” If EHRs are to become a reality for most Americans, as is the President’s goal, we must go where the patients are, and that is in small physician practices, not hospitals or large physician clinics. In 2005 (the most recent year with available data), there were 965 million patient visits to physician offices compared with 206 million visits to hospital clinics and emergency departments and 35 million hospital inpatients. More than three quarters of physician visits occurred in practices of five physicians or fewer, according to data published by the National Center for Health Statistics. 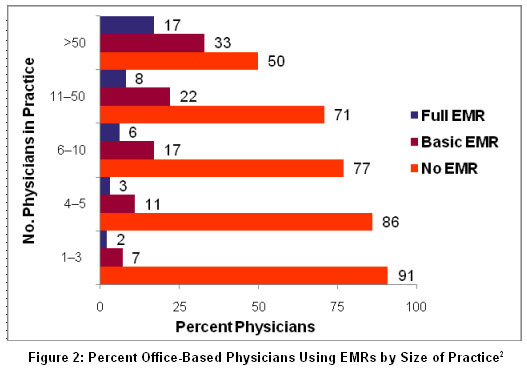 While small practices see the majority of patient visits in the United States, less than 10% have even a basic EMR (See Figure 2). Among all office-based physicians in the United States, only a minority has adopted electronic systems, and their use is most prevalent among primary care physicians and those practicing in large groups, hospitals, or medical centers, according to a July 3 article in The New England Journal of Medicine. This is not surprising, since most EMRs on the market are best suited to hospitals and large clinics that have the management bandwidth and IT resources to support their feature sets and hardware requirements. Physician practices of five or fewer physicians have different operating characteristics from hospitals or large physician clinics. What they need are basic EMR systems that offer electronic clinical notes, medication lists, and lab and imaging results. And since these small practices typically lack the IT infrastructure required to support a client-server based system, a Web-based EMR system is desirable. This is important to medical transcription because about one half of U.S. medical transcription is outsourced, which means physicians in these small practices are currently our customers. As a service industry, we are in an ideal position to help our clients transition from paper charts and fax machines to simple EMRs that are accessible electronically. One of the first things we learned by talking to customers is that there is a lot of confusion about what constitutes an EMR, and part of the problem is that there is tremendous variability in what is being marketed as an EMR. If EMRs were motor vehicles, some would be scooters, some would be sedans, and some would be motor homes. Two recently published studies, one in The New England Journal of Medicine and the other from the National Center for Health Statistics, have sought to define what constitutes an EMR. 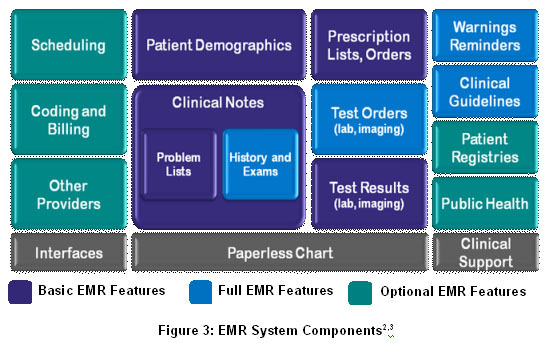 A basic EMR includes patient demographics, clinical notes with patient problem lists, medication lists, prescription ordering, and the ability to view lab and imaging results (See Figure 3). This system is commonly used as a paperless chart and to provide information for patient billing. This is the EMR equivalent of a scooter and provides all the functionality most small practices require. Fully functional EMRs add electronic test ordering, full history and exam notes, and clinical support tools such as drug warnings and guideline-based screenings. These are the equivalent of EMR sedans and are useful for physician practices that have experience using a basic EMR. Finally, EMR motor homes contain advanced features such as interfaces to enable data sharing among providers and reporting tools to guide clinical decision support. These EMRs typically meet Certification Commission for Healthcare Information Technology requirements, which for ambulatory systems includes more than 250 criteria in 40 categories for functionality alone. These feature-rich EMRs are best suited for hospital systems and large medical practices that can devote full-time employees to running these applications and producing reports for management and clinical use. As my company reviewed the various EMR categories, we realized how similar transcription platforms were to a basic EMR. In fact, an Internet-accessible transcription platform can be a great first step toward an EMR, allowing a small practice to begin moving to a paperless chart in incremental steps. Best of all, many transcription providers offer such platforms as part of their routine service, which means they can provide EMR scooters to smaller physician practices at a low cost. When practices are ready to add more advanced features, transcription companies can bring in document management or EMR companies to provide systems that are dictation friendly. It can be disheartening to hear EMR vendors tout their products as a way to eliminate transcription, especially for those who have devoted their careers to medical transcription and recognize its value to patient care. The industry needs to articulate the benefits of dictation and transcription as part of the documentation options available to physicians with or without an EMR. Today, physicians use one of three primary methods of documentation: dictation, structured data entry (keyboard, touch screen, mouse), or front-end speech recognition. In our experience and that of many EMR vendors with whom we’ve spoken, dictation is the preferred choice of 80% of doctors. Why? Dictation is the most efficient way to document patient care. Take the example of a typical outpatient visit to an internist. 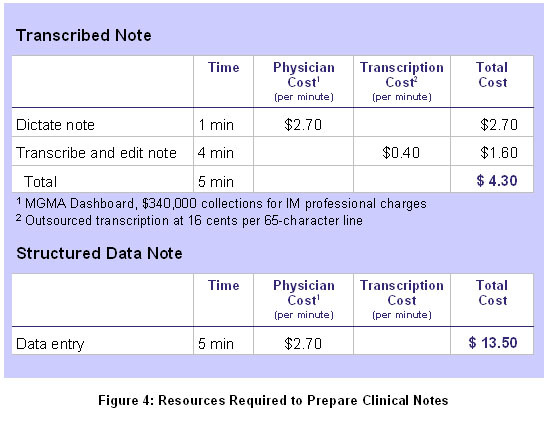 It takes about one minute to dictate a note for an established patient and about $4.30 in direct and indirect costs (See Figure 4). By contrast, many EMRs use structured data entry as the primary method for entering clinical notes, in which physicians point and click their way through drop-down menus. The time required is at best equal to that of a transcribed note, and physicians often report it takes 8 to 10 minutes to complete a note using structured data entry, meaning the indirect cost to physicians is anywhere from $13.50 to $27. Indeed, physicians may “save” $1.60 in outsourced transcription expense but at the cost of their valuable time. In our experience, this loss of productivity with structured data entry is the single biggest barrier to physician EMR adoption. By contrast, transcription customers are delighted to learn they can continue to dictate and let the transcription service deliver the clinical note to their EMR. Dictated notes have another advantage over notes created through structured data entry. Clinical notes are intended to help organize a physician’s thought process and tell the patient’s story in a concise manner, but EMR-generated notes can eliminate this basic function. 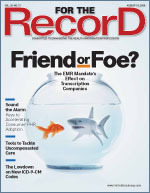 According to the article “Off the Record — Avoiding the Pitfalls of Going Electronic” published in a recent issue of The New England Journal of Medicine, “Notes that are meant to be focused and selective have become voluminous and templated, distracting from the key cognitive work of providing care. 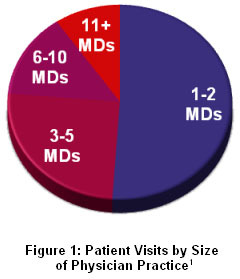 Such charts may satisfy the demands of third-party payers, but they are the product of a word processor, not of physicians’ thoughtful review and analysis.” The best solution may be a combination of structured data and dictated notes integrated within an EMR, with physicians having the ability to choose their preferred mode of documentation. What about speech recognition? The technology has its benefits and drawbacks, and it has been found to be a good solution for some practice-based physicians. The benefits of front-end speech recognition are that it produces clinical notes in real time and can reduce transcription costs. Its drawbacks are that physicians must format and edit their own notes and letters, and speech engines require regular maintenance to optimize accuracy. Speech recognition is a great tool for some physicians, but it is rare that an entire practice will adopt it, so it is best offered as an option within a transcription service or EMR. The good news is that it is not transcription against the rest of the medical documentation industry. Many software companies recognize that dictation and transcription play a key role in medical documentation. And transcription companies have a valuable asset to bring to the table: long-time clients who trust and depend on their services. The goal is to offer technology to clients while keeping them as clients. The way to accomplish this is to seek transcription-friendly technology partners who complement your business. Topping the list are document management and EMR vendors, who often have difficulty reaching smaller practices with a direct sales model and can combine their software with your services. Billing and coding companies are other potential partners. Most transcription services produce electronic patient notes. If you can tag your notes to interface with coding and billing systems, it can reduce the time required to prepare patient bills and help physician practices get paid more quickly. About 40% of office-based physician practices that don’t currently have an EMR are considering a purchase within the next three years, according to information from the National Center for Health Statistics. Forward-thinking transcription companies will view this more as an opportunity than as a threat. Those that are not prepared to work with EMRs will suffer the consequences—clients may assume you are just a “typing company” unless you let them know otherwise. More astute transcription companies will arm themselves with the knowledge and resources to include dictation and transcription as an integral part of the EMR workflow in an effort to help clients build a better EMR migration plan. — Robin Daigh is vice president of business development and marketing at MD-IT. 2. DesRoches CM, Campbell EG, Rao SR, et al. Electronic health records in ambulatory care: A national survey of physicians. N Engl J Med. 2008;359:50-60.